Anyway, I’ve been studying the use of conflict in writing as of late, even to the point of watching the driving force of conflict in film, in novels and short stories I’ve been reading, and in my life. Enter tranquility and peace…enter conflict…enter somewhat settling of conflict…enter more conflict…enter even more conflict…enter another somewhat resolution with or without tranquility. What I discovered last year while writing for NaNoWriMo was that channeling conflict into my writing actually made me a less contentious person in life. I could give most of my frustrations, aggravations, and issues away for a month to my characters and let them figure out how to solve them. My emotional health was amazing…and not just because my diet consisted of Skittles, chocolate, rolls, turkey, pies, and varied pumpkin dishes. 🙂 I was living in creativity and loving the experience…and less personal conflict in my life! So, all you writers (and readers) out there: Is conflict difficult or freeing to write? To read? How much is too much? And, will you WriMo this year? PS–I’m thinking seriously about posting the novel I wrote last year in chapters on the blog. Thoughts? I could use some feedback. 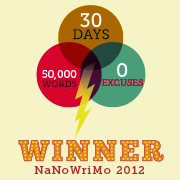 As many of you may well know, I completed my goal to write 50,000 words of a novel in thirty days for NaNoWriMo last November. And, up until this week, I had edited about 20 pages of my (so far) 198 page manuscript. I have been devoting more time to working on it as of late…and I am continually reminded of what I learned last November 30. I DON’T KNOW HOW TO END A NOVEL. Thank goodness I have plenty of editing to do before I get to revisit that ending endeavor I performed toward the end of last year. As NaNoWriMo is a purely creative effort, I have found that minor characters have different names throughout the text as I reread it, and I’ve found some continuity issues with which I am dealing…and some character development…and so on…and so forth. 🙂 But, as I work on it, I am reminded of the energy I feel when I am writing as well as the happiness I feel when I am typing away at my screen, figuratively painting words onto a page…sillouhettes of lives and stories. Also, I would like to say HUZZAH as I think I have made it through the enormous stress bubbles which have been clouding my vision and invading my ability to see clearly (and I am BEYOND THANKFUL). I want to give each of you a shout-out for all your support and help through these past couple months (which have been anything but easy for me). After some events and visitors this past weekend, I came home from errands Monday morning, cuddled with my preschooler on the couch, and we slept for a glorious two hours. Upon waking, my head was clear, my vision was focused, and my energy was tangible. As I have continued through this week, I am still feeling happy (mostly) and satisfied. My perspective has enlarged, and I am moving forward (after a quite stagnant several weeks). I am feeling relief! And I am writing! And…guess what? I am oh-so-happy!!!! I have always felt a strange sense of responsibility regarding the naming of a life. I have long felt that a name can have so much to do–for good or ill–in the formation of a life. My dad used to tell us about ways that children made fun of his name when he was a child. I also remember that my brother’s name was one that was used jokingly. Thankfully, my name’s pronunciation was difficult enough to say, much less make fun of, which I’m sure saved me some sort of embarrassment in one way while creating it in another. Oh, well. Still, as we brought each of our children into this world, I felt a powerful need to create a strong force around them with regard to their names. I wonder if I have taught them enough about the reasons and feelings around the names they have been given. I wanted them to each have powerful and purposeful names and to know the meaning of their names…but, like all lessons in life, I’m sure this one’s presence in their minds waxes and wanes like the phases of the moon. Similarly, when I write, I find myself struggling again to name a character…to summon the forces of nature and writing to again create a life. Sometimes I find myself, though I am past searching for names of lives that will come from my own womb, pouring over baby name books, searching for the name to fit the character I see in my mind’s eye. I still feel a sense of ownership with these characters, who in some way become real to me, just as Jane Eyre, Clare Abshire, and Anastasia Steele are real to so many (I recognize that these women are oddly grouped…sorry). I was also reminded this weekend as my husband and I attended the latest film from a franchise older than I am what is in a name…the faces may have changed several times over the years, but when a British accent speaks the name, “Bond…James Bond,” people listen. His name has a power. So, do you know why your name is what it is? Did you ever want to change it? And what have you done with your name to make it yours? Posted on December 12, 2012 Categories Motherhood, Musings, WritingTags baby names, characters, lifestyle, literature, names, naming children, writing6 Comments on What’s in a name?